Bran, butter or oil, milk, egg and sugar are the basic components of a standard bran muffin. The truth is all of these ingredients can be part of a healthy diet, but bran muffins can also be high in calories, fat and sugar. With a few modifications however, the bran muffin can become a shining example of that which tastes good, and is good for you. Bran is the outer layer of a wheat kernel and adds fiber, vitamin E, B vitamins, minerals, antioxidants and phytochemicals to bran muffins. The daily recommended intake of fiber to benefit health is 25 to 38g. According to a 2009 article from Nutrition Reviews and the American Dietetic Association, fiber is positively associated with a lower risk of heart disease, stroke, hypertension, diabetes, obesity, and gastrointestinal diseases. Fiber also promotes regularity and can prevent constipation and hemorrhoids. 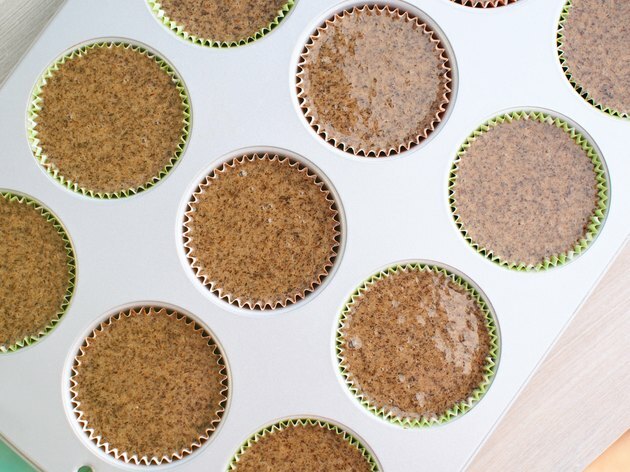 Butter and oil are the two fats most commonly used in bran muffins to tenderize, flavor and leaven the final product. An excess of dietary fat is associated with obesity and other chronic conditions, but lowering the fat in a bran muffin is easy to do. Try replacing some or all of the butter or oil in a recipe with unsweetened applesauce, fruit puree or nonfat yogurt. There may be textural or flavor changes with these substitutions, so experiment with different amounts and products until the end result is satisfactory. Milk and egg are the proteins in bran muffins that give it texture. They are also sources of calcium, vitamin D, phosphorus and B vitamins which are essential for good health. Unfortunately, these ingredients can be high in calories, fat and cholesterol. Low or fat free milk has all the nutritional advantages of regular milk, but without the calories and fat. Two egg whites can also be substituted for one whole egg, cutting out 50 calories and lowering cholesterol to less than 1 mg.
Sugar tenderizes and adds color to bran muffins. Unfortunately, too much sugar can cause dental cavities and adds extra calories. Diabetics and pre-diabetics also need to limit added sugars. Sugar substitutes like saccharine (Sweet ‘N Low), acesulfame potassium (Sunette) and sucralose (Splenda) are low in calories and are good replacements for regular sugar in bran muffins. Aspartame (Equal) loses its sweetness when heated and is not appropriate as a sugar substitute in baking. The addition of pineapple, carrots, banana and zucchini to a basic bran muffin recipe can contribute to reaching the five servings of fruits and vegetables recommended daily by the U.S. Department of Agriculture at MyPyramid.gov. Nuts are also a healthy addition because they have omega-3 fatty acids that promote heart health. Monitor portion sizes when eating out--a single serving of grains is only 1 oz., which equals a small muffin that is 2 1/2 inches in diameter; commercially sold muffins are often closer to 3 oz. Condiments like butter, honey and jam should also be controlled because they add calories and/or fat. “Nutrition Review”; Health benefits of dietary fiber; JW Anderson, P Baird, RH Davis, S Ferreri, M Knudtson, A Koravm, V Waters, CL Williams; April 2009.